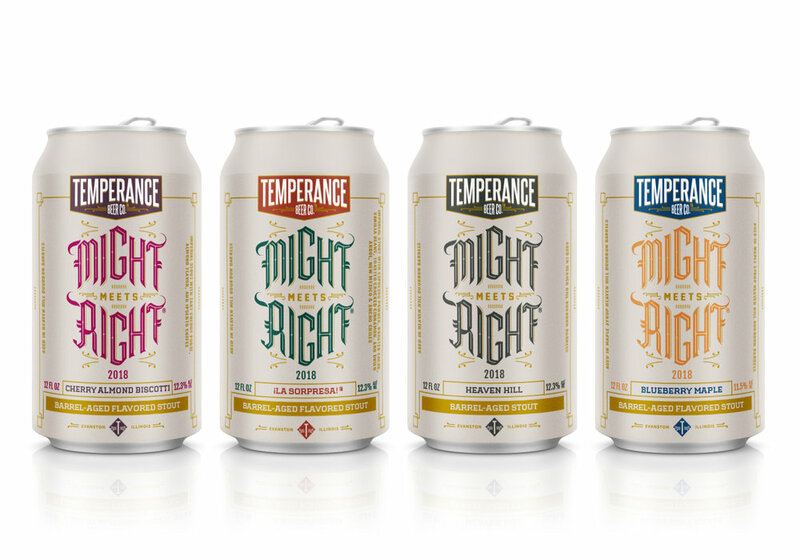 2018 Might Meets Right® Release Party — Temperance Beer Co. Since last year’s innovations were so well received (variants! cans! variety packs! ), we’re doing it again! Plus, we have two NEW VARIANTS FOR 2018: Blueberry Maple and Cherry Almond Biscotti (replacing Coffee Maple and Bramble). Ipsento will be with us pouring hot coffee & Mad Moxie will be dishing up food for those in line starting at 11:30 AM. And our good friends Funk Trunk Records are back with an all-vinyl DJ set with from noon till 5pm. Of course, all 4 variants will be on tap, and we may just tap one or two special beers as well. It’s gonna be a (day) party! Heaven Hill is the stalwart, that to which the others are compared—the O.G. Rich dark malts collide with notes of vanilla, oak, and a hint of sweet bourbon. 12.3% ABV. ¡La Sorpresa! is blended with a myriad of ingredients: roasted cacao, toasted cracked cinnamon, vanilla beans, and three types of dried chiles—Ancho, New Mexico and Árbol—to give this variant big, layered flavor and a satisfying kick of heat. 12.3% ABV. Blueberry Maple (NEW FOR 2018) is aged in maple syrup Heaven Hill Bourbon barrels and blended with ripe blueberries, making this the stout for pancakes! And really just about anything else. 11.5% ABV. Cherrry Almond Biscotti (NEW FOR 2018) is our Italian cookie stout with almond flavor, tart cherries, and freshly roasted Ipsento coffee melding together for a unique and balanced take on the idea of a pastry stout. 12.3% ABV. LIMIT TWO 4-PACKS PER CUSTOMER.